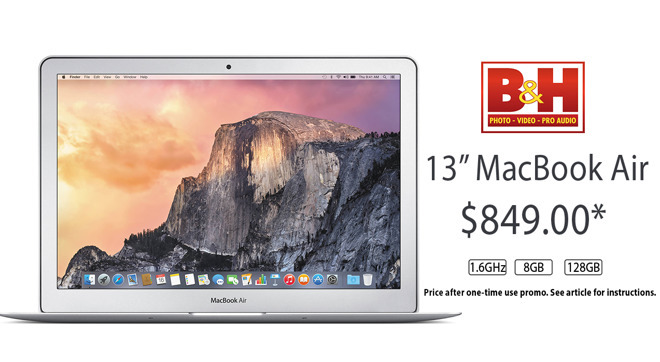 DEAL EXPIRED: Now through Dec. 22 or while supplies last, B&H is exclusively offering AppleInsider readers bonus coupon savings on Apple's current 13-inch MacBook Air with 8GB of memory, bringing the price down to $849.00. This is the lowest price from any authorized reseller in our 13-inch MacBook Air Price Guide thanks to an extra $20 off with our exclusive batch of single-use promo codes. What's more, these systems are in stock and qualify for free expedited shipping. On top of that, B&H will not collect sales tax on orders shipped outside NY and NJ. This means shoppers outside these two states can save $230 compared to paying full price with tax at the Apple Store. Price after one-time use promo code. Please see the instructions below to request a code. To secure the bonus savings on top of B&H's already reduced pricing, please email us at [email protected] and we'll send over a time-sensitive, one-time-use coupon code to activate the deal. This deal runs through Dec. 22 or while supplies last (quantities are limited). You can easily tack on an AppleCare extended protection plan to this 13" MacBook Air at a discounted rate of $229 by selecting the AppleCare option immediately after you press the "Add to Cart" button on B&H's website. Or just use this link.